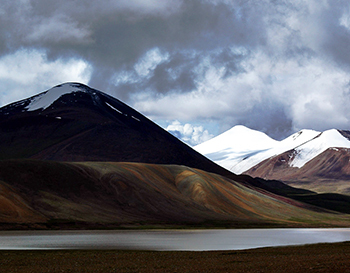 The snowy Kunlun Mountains stretch 2,000 kilometres (1,250 mi) from the far reaches of the Pamirs in Tajikistan through to the centre of Qinghai province in China and represent one of the longest mountain chains in Asia. They tower along the border between Xinjiang and the Tibet Autonomous Region and, at their westernmost point, form the Inner Asian rampart between the Tibetan Plateau and the Tarim Basin. At the southern edge of the Takla Makan Desert, these snowy mountains form a protective barrier against the icy expanses of Tibet and appear strangely beautiful surrounded by the soft golden sands. This range is so colossal that it branches off into several other mountain ranges, including the Altun Mountains and the Qilian Mountains. Unsurprisingly this has earned it the nickname the “Forefather of Mountains”. The highest peak of the range, Mount Keriya, can be found in Yutian County of Xinjiang and sits at a staggering elevation of 7,120 metres (23,300 ft.), making it over 1,000 metres (3,300 ft.) higher than Mount Kilimanjaro! Unfortunately this high altitude and the desert conditions that prevail throughout the range largely inhibit the growth of vegetation and make the area virtually uninhabitable. Or so it would seem! Much of the terrain consists of rock deserts, punctuated only by the occasional stagnant pool of water. Not exactly the most welcoming sounding place! Yet a number of rare animal species still manage to scrape a living in these barren wastes, including the Tibetan gazelle, Tibetan antelope, and wild yak. In the more humid and hospitable western portion of the mountains, argali sheep graze on the high grasslands and the upper crags are home to blue sheep and ibex. The willow thickets provide the perfect habitat for brown bears, wolves, and the occasional snow leopard, so don’t tread through them lightly! In fact, the animals aren’t the only ones making a home out of this seemingly desolate place. The mountain range supports both permanent and migratory populations of people from the Uighur, Mongol, Tibetan, Tajik, and Kyrgyz ethnic minorities, as well as large constituencies of Han people. This is evidenced by settlements around the Kunlun Mountain Pass, just 160 kilometres south of Golmud City, which once made up part of the Silk Road. It is an obligatory section on the route between Qinghai and Tibet and represents a sudden rise in altitude from 2,800 metres to 4,700 metres (9,200-15,400 ft.). The temperature and air pressure drop rapidly as you ascend, so this hike isn’t for the faint of heart. It has also enjoyed great fame for the stunning Kunlun Jade, which is predominantly mined here. The mysticism surrounding this mountain range is undeniable and it has featured in numerous Chinese folk legends, including those of Chang’e (the goddess of the moon), Journey to the West, and The Legend of the White Snake. In other legends, it was believed to be the origin or father of all mountains. That being said, it is unclear whether the Kunlun Mountains were named after the legendary Kunlun Mountain of Chinese mythology or whether they are believed to be the site of the Kunlun Mountain itself. In terms of the Taoist faith, these mountains are incredibly sacred and, according to legend, were first visited by King Mu (976-922 BC) of the Zhou Dynasty (c. 1045-256 B.C). It was here that he supposedly discovered the location of the Jade Palace, where the mythical Huang Di or “Yellow Emperor” lived, and met the Queen Mother of the West, who was the focal figure of an ancient religious cult that peaked during the Han Dynasty (206 BC–220 AD). The Taoist connection to the mountains has led to a style of kung-fu known as Kunlun Mountain Fist being associated with it, although it bears great similarity to another style called Kunlunquan that originated from Kunlun Mountain in Shandong province. Its history can be traced all the way back to the Zhou Dynasty and it is one of the few Taoist sects of martial arts where students of both genders are accepted and members are allowed to marry. So in short, don’t mess with any of the married couples around the Kunlun Mountains!